EB Realty Management wrote the book on tenant satisfaction. 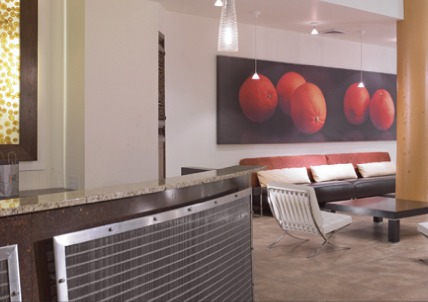 Each property gets the personal touch, from the 24/7 front desk staff to the management office. We know every detail of each loft because we designed it and built it. Recognized across Philadelphia for our innovative living spaces, we are leading the revitalization of the city we love. It's home. Welcome. EB Realty Management Corporation is considered to be one of the premier management/development firms in the City of Philadelphia and is widely considered to be the "turn around specialist" in the Philadelphia marketplace for its repositioning of numerous communities. 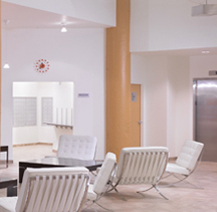 EB Realty Management continually strives to be the best of luxury apartment communities in Philadelphia, with a focus on security, lifestyle and innovation in marketing. EB Realty Management has been recognized by such organizations as the Apartment Association of Greater Philadelphia and the Preservation Alliance. From I-76, take 676 East to Broad Street Exit. 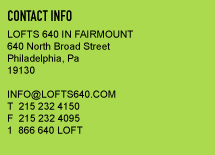 Left on Broad, crossing Vine and Spring Garden Streets, Lofts 640 on left. From I-95, Take 676 West to Broad Street exit. Follow the exit ramp to Vine Street. Turn left on Vine Street and left on Broad Street, crossing Vine and Spring Garden Streets, Lofts 640 on left.